Raith Rovers have signed Craig Wilson on a two-year deal after he completed a successful loan spell. 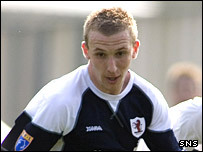 Wilson joined Rovers from Dunfermline Athletic last October in an emergency transfer and he performed well at right back for the Stark's Park outfit. Raith boss John McGlynn told the club website he was delighted with the move. "Craig played a big part in our surge up the league table in the second half of last season. I'm sure he'll help our push for promotion," said McGlynn.